The Chanler at Cliff Walk may just be the most beautiful setting for your Rhode Island babymoon. 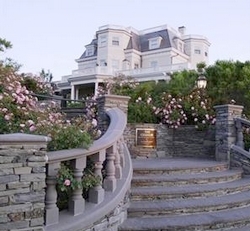 This historic, European styled boutique hotel offers some of the best views in Newport. Situated just steps from the beach and a mile from downtown, it is conveniently located to area attractions. Each of the 20 guest suites are uniquely designed to reflect a different historical period and provide an intimate stay. After a delicious gourmet Chanler breakfast(included with your stay), spend the day exploring the exquisite historical mansions of Newport. End your day with a romantic dinner for two at The Spiced Pear, The Chanler's award-winning restaurant. Enjoy your babymoon in this luxury inn, located on a peninsula on the western-most tip of Newport, just at the entrance of Narragansett Bay. Named 'The Most Romantic Retreat in New England' by Forbes in 2015, Castle Hill offers everything you need for a relaxing and rejuvenating stay, including pampering spa treatments and fine food, prepared with fresh, local ingredients. Whilst you may be content to simply enjoy the beauty and serenity of Castle Hill's stunning surroundings, the historic mansions, shops and action of downtown Newport are all in easy reach.